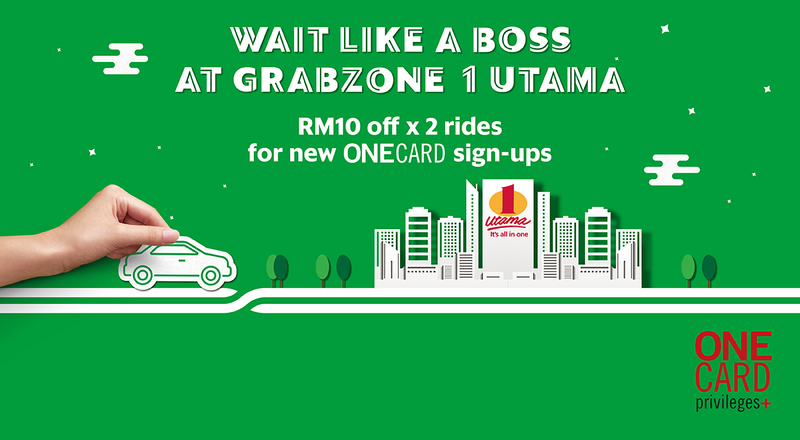 Introducing GrabZone 1 Utama, our coolest pick-up and drop-off point ever! Conveniently located at 1 Utama’s Highstreet Main Entrance and delightfully decorated with artwork from a local artist, it’s the perfect spot to chill while waiting for your Grab rides. And from 11 October 2017 till 11 February 2018, you can also score RM10 OFF x 2 Grab rides to/from 1 Utama! Book a Grab ride to/from 1 Utama. Flash your Grab receipt at any 1 Utama Customer Service Centres or Concierge. Sign up for a 5-year ONECARD membership for only RM30. Two unique promo codes for the ride discounts to/from 1 Utama will be sent to you by SMS. The validity of these promo codes are till 31 March 2018, find out more here. From 11-12 Oct, 10am – 10pm, drop by the GrabZone 1 Utama and enjoy some free ice cream when you show us proof that you took a Grab ride to 1 Utama. Limited to the first 500 redemption daily. The Campaign will run from 11 October 2017 until 11 February 2018 only. The Organiser reserves the sole and absolute right to alter or end the Campaign at any time prior to the expiry of the Campaign Period without giving any prior notice and no compensation in cash or in kind shall be given.